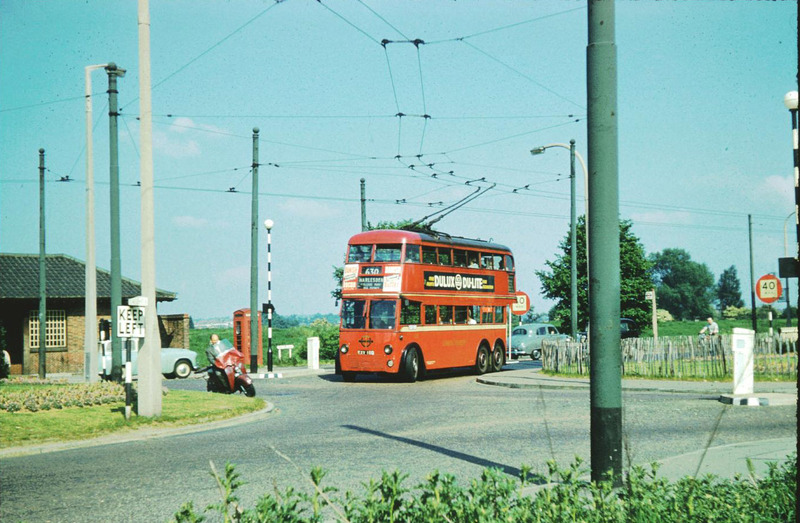 The 630 trolleybus has just passed across Mitcham Common and is alongside the Ravensbury Arms Public House, which is just out of sight. Here, for many years, the car park hosted, each weekend, a collection of paintings for sale by local artists. 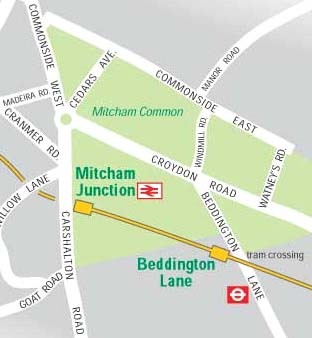 Carshalton Road is to the right where Mitcham Junction station is about a quarter of a mile away. Picture 1000 was taken on 15 November 1999 and while it would have been nice to capture a shot of the Tramlink replacement bus service, none appeared despite a 30 minute wait. With the taste of traffic fumes, it was time to move on. 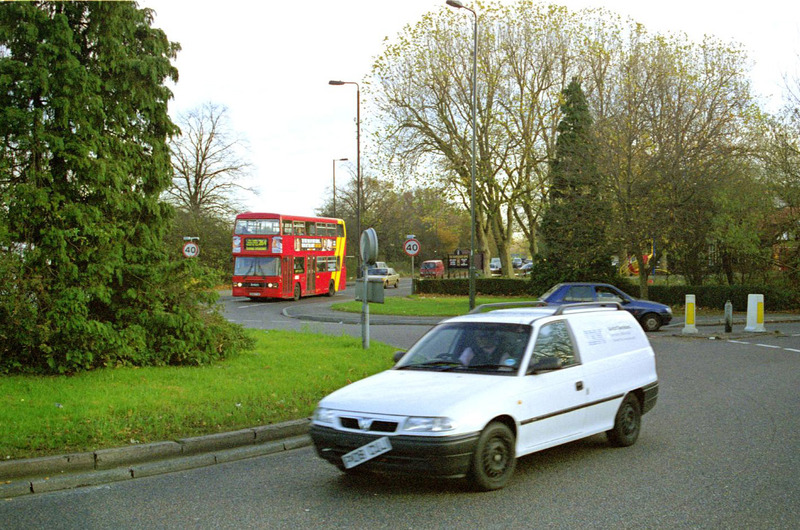 The roundabout was constructed in the early 1950s, prior to which Croydon bound trolleybuses stopped at the fine waiting shelter, complete with toilets, that is seen in the picture. Neither the waiting shelter nor the phone box have survived into the present day, and is unknown when they were removed/demolished. Picture AB750 is from the British Trolleybus Database CD and captures a class F1 trolleybus 750, based at Hanwell depot, giving additional support to the regular batch of trolleybuses on route 630 out of Hammersmith depot. Again the location is by the Ravensbury Arms in more tranquil traffic conditions at the beginning of 1950, without the need for a roundabout and perhaps a hint of road surface scaring of former tram tracks of route 30. From this location it is a short walk along Carshalton Road to Mitcham Junction station where a view over the railway parapet in 1999 catches a glimpse of a train on the Victoria to Hackbridge rail service and a Wimbledon bound tram. Oddly enough way back in 1960 when picture 70 was taken, I never thought to do just that, missing out on pictures of the former heavy rail stock and the rail station as a true junction. 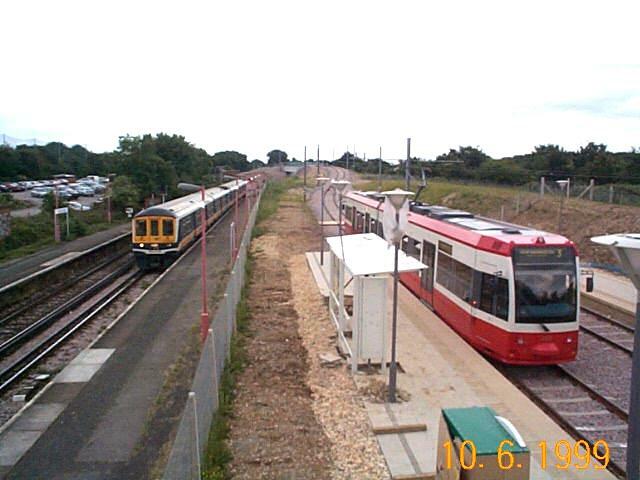 Just a wee carp about your 1999 pic of train and tram at Mitcham Junction, I'm afraid. The heavy rail train looks to me to be a Thameslink Class 319, headed northbound for Blackfriars and points north, probably Luton, rather than the South Central Victoria-Sutton service suggested. I offer this suggestion on the basis of the colours of the unit. If I'm right, the train will have run round the "Wall of Death" route from Wimbledon to Sutton via St Helier. This line was only built by the Southern Railway shortly before the Hitler war, as a "spoiler" for further tube intrusion south of the Thames - in which effort, it, probably aided by Hitler's interruption of normal life, was successful. The unofficial monicker refers to the steep gradient encountered where the line leaves the Sutton-Epsom route - you seem to drop off the edge of the world! Main line railways in suburban London had cause for real concerns about tube expansion in those days - LNER got very worked up about the 1935 Northern Heights LT proposals, with justification. Again, only Hitler really stopped the Northern at Edgware, rather than extending onward to Bushey Heath or even Watford Market. As per your recommendation, Hugh Taylor's latest book now graces my shelves. A Class album indeed! All that colour is a great joy, especially with grey Winter outside my cottage window, here in France! Long may your site be successful! It was fascinating to see your trolleybus pictures on their travels around Croydon. I was born in Mitcham Road in 1958. My mum was born in the same house in 1933 and still lives their today! [she's always talking about Croydon during the war]. I'm looking forward to showing her your photographs, especially of the 'Lombard' Roundabout which is just how I like to remember it. Also the 'Ravensbury Arms' at the end of the common. You reminded me of the paintings of local scenes on display in the pub car park in the 60's. Great Nostalgia! Great Web Site!